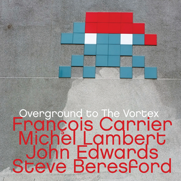 Due to exceptional luck, tonights performance of 'Overground to the Vortex', will have the following cast. "Underground to the Vortex" is a classic love story. The Anna Karenina of free jazz. Drums meets Sax, they fall in love and stay together for years and have multiple children. (Many of which have been reviewed on this very site.) Sax goes away to England on a grant to get away from Canada for awhile and see what's new. While there Sax meets Bass and they start playing together. Drums hears about this and decides to fly to England to see if it's real. The three of them play a show, which was thankfully recorded, and all seemed well until the arrival of Piano. Act One Scene One 'Mile End'. When François Carrier plays the role of Sax, it always has a joyful and lyrical voice, and this track is no exception. Here John Edward's Bass keeps up with him so well that you may find yourself looking at the liner notes wondering who the second horn player is. But then something amazing happens. Michel Lambert's Drums burst onto the scene strutting all of the assertiveness he can muster giving Bass no option but to switch focus and soon laments with the bow on the stresses of making a decision and ultimately, whether intended or not, brings Sax and Drums closer together. Act One Scene Two 'Bow Road'. They have all settled in and are very comfortable in each others presence. This comfort allows them to take some time and experiment with rhythms and repetitive phrasings. There is a great moment about halfway through the scene where Sax cries over a wonderful Bass and Drums moment where they lock into s very straight pulse and give the track a real lift. According to the notes, Carrier breaks character and performs a magic trick for the attendees. Just the kind of guy he is. Act Two Scene One 'Archway'. Steve Beresford's Piano enters stage left. It is sultry and inviting and it calls out everyone's dance card and they all accept. As long a history as Canadian Sax and Drums have, the relationship between British Bass and Piano cannot be overlooked or denied. They were both an important part of the greatly acclaimed Foxes Fox and also have a extensive live history together. This scene rarely gets split between these nationalistic duos but when they do, they reverberate with ideas. Soon they become a quartet. They live and let breathe, diving in and out of each others way. Adding delicate touches. Blasting new paths. Sax has a vision for the ending of "Overground to the Vortex" and it is made quite aware may different ways. Sax starts alone and sets the tone early. Everyone jumps in my never venture too far away from the central idea. Even when the foggy wind storm of improvisation reaches its peak, Sax grounds everything with a well placed rhythmic phrase that becomes everyone's lighthouse. Sax returns to ideas that have been hinted to earlier and when the last note rings out, you will feel that everything is complete and not one other note was needed. Everyone gets along, everyone wins.